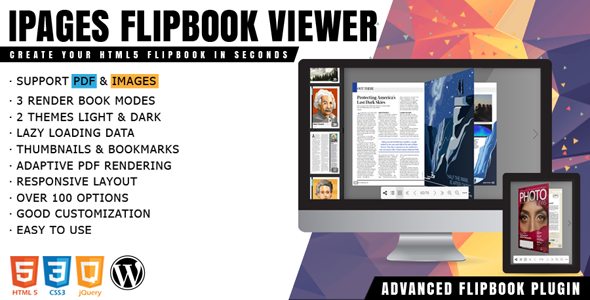 iPages Flipbook PDF Viewer is a lightweight and rich-feature WordPress plugin helps you create great interactive digital HTML5 flipbooks. With this plugin you are able to easily make media books for your site that empower publishers and bloggers to create more engaging content. It provides an easy way for you to convert static PDF documents or image sets into the online magazine, interactive catalogs, media brochures or booklets in minutes. The plugin can be deployed easily and runs on all modern browsers and mobile devices. The license of this plugin is for one website. If you want to use the plugin on another websites you need to purchase licenses for each.